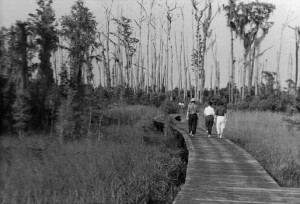 When the three-quarter mile long boardwalk on Okefenokee’s Chesser Island was devoured by the Honey Prairie Fire on June 13, 2011, the National Wildlife Refuge lost one of its most treasured assets. 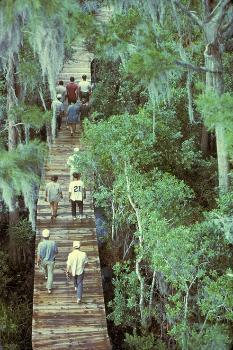 Nearly two years later, work is underway to replace this walkway into the swamp. 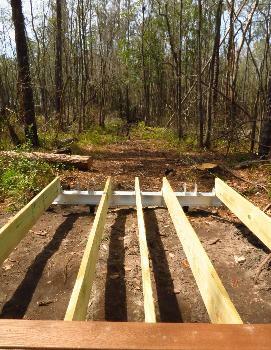 Hydra Engineering and Construction, LLC, of Crawfordville, Florida, designed the new boardwalk and began mobilizing on site February 26. Materials began arriving a month ago, and the first few yards of the planking are now in place. The anticipated completion date of the project is early August. The wooden boardwalk will be rebuilt using Trex, a wood polymer product. Trex uses recycled plastic grocery bags and stretch film, as well as waste wood from making furniture and shipping pallets. This recycled materials product illustrates the U.S. Fish and Wildlife Service’s commitment to using “green construction” whenever possible. Joists will be of pressure-treated lumber, and galvanized helical piers with aluminum beams will provide added fire-resistance. A pioneering sprinkler system will be employed to prevent destruction by all but the hottest fires. A 3,700 foot waterline will service 88 sprinkler connections placed every 40 feet, from the bathrooms at the parking lot to the top of the observation tower. The boardwalk will follow the same path as the old one, and when the boardwalk reaches the end at Seagrove Lake, the Owl’s Roost tower will be repaired with pressure-treated lumber. Damaged wooden supports on the tower will be replaced with steel to make it stronger and more tolerant to future fires. 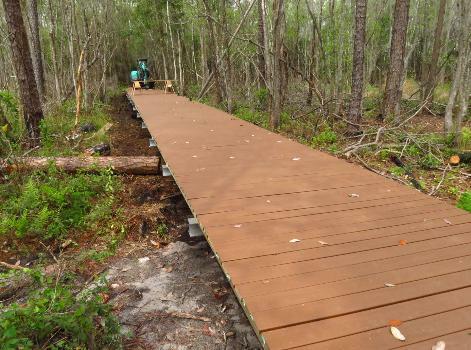 The new boardwalk will also be eight feet wide, and like the old one, will not have a railing – providing an unobstructed experience with the swamp landscape and wildlife. It will also have four 16×16 foot covered pavilions with benches. These are experiences that will return upon completion of the famed boardwalk. 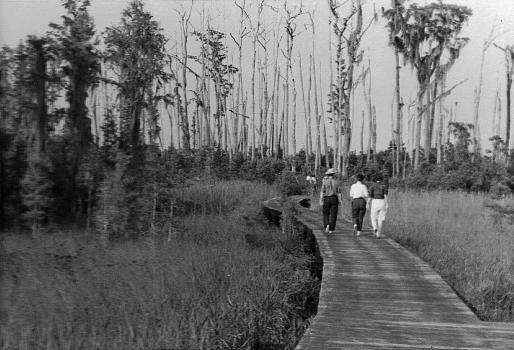 Because the fire cleared out many trees, the view will be reminiscent of when the boardwalk was completed in 1970. (See photo). The parking lot and restrooms at the trailhead will be closed until construction is completed. View of boardwalk as it was before the fire, as seen from above Construction as of Easter Sunday – the first framing was in place As of April 7, the first few yards of Trex planking has been laid. ext. 233 or Susan_Heisey@fws.gov. In order to allow sufficient time to process requests, please contact us for assistance at least five business days before the event. who make it happen, visit www.fws.gov. Connect with our Facebook pages at www.facebook.com/okefenokeewildliferefuge or www.facebook.com/usfwssoutheast, follow our tweets at www.twitter.com/usfwssoutheast, watch our YouTube Channel at http://www.youtube.com/usfws and download photos from our Flickr page at http://www.flickr.com/photos/usfwssoutheast. The wooden boardwalk will be rebuilt using Trex, a wood polymer product. Trex uses recycled plastic grocery bags and stretch film, as well as waste wood from making furniture and shipping pallets. This recycled materials product illustrates the U.S. Fish and Wildlife Service’s commitment to using “green construction” whenever possible. Joists will be of pressure-treated lumber, and galvanized helical piers with aluminum beams will provide added fire-resistance. A pioneering sprinkler system will be employed to prevent destruction by all but the hottest fires. A 3,700 foot waterline will service 88 sprinkler connections placed every 40 feet, from the bathrooms at the parking lot to the top of the observation tower. The Chesser Island boardwalk provided one of the only good walking-access views into the swamp, and it has been sorely missed. Visitors began the trip from the pine uplands of Chesser Island, traveling through the transition zone of scrub-shrub before reaching the open marsh areas. Then they walked onto a cypress dome before ascending the 40-foot Owl’s Roost Observation Tower with its expansive view of Chesser Prairie. Pairs of resident Florida sandhill cranes could often be seen with their young only 50 feet from the boardwalk. Of course, alligators and turtles would be much closer, and other wildlife and a variety of birds would be seen. It was an intimate experience of swamp life that could be had without getting one’s feet wet. It was also a rite of passage for many school groups, whose visit to the refuge wasn’t complete without making the trip down the boardwalk. It was the primary outdoor classroom for the refuge, both informally, and through formal ranger-led interpretive and environmental education programs. Locals used it for their daily exercise and socializing, and visitors would even set up easels and paint “plein air.” These are experiences that will return upon completion of the famed boardwalk. Because the fire cleared out many trees, the view will be reminiscent of when the boardwalk was completed in 1970. The parking lot and restrooms at the trailhead will be closed until construction is completed.